Galaxy S7 and S7 Edge both are running on Android Oreo now. If you have recently updated your Galaxy S7 or S7 Edget to Android Oreo via Odin, you must have lost the root. This happens because a new firmware wipes off everything from your phone including root access. In such a case, you have to root your phone from scratch once again. 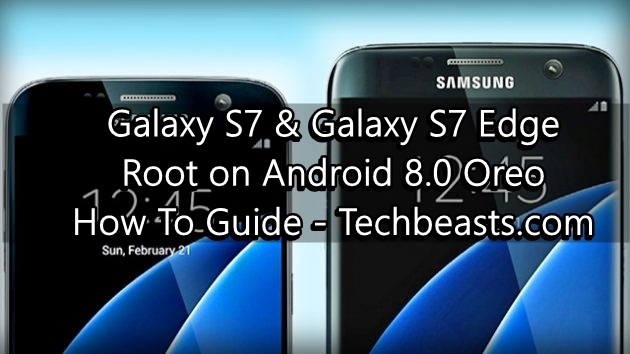 This guide will walk you through all the steps to root Galaxy S7 and S7 Edge on Android Oreo. Luckily, rooting the Galaxy S7 and S7 Edge on Android Oreo is the easiest thing. You only need to follow a few steps carefully and you are all set to enjoy unlimited benefits of root access. If you are new to rooting, you may want to get a little idea of what is it and how it helps you. Rooting your phone will let applications access the system of your phone. It means only such applications, that require root privileges, will access the system. These applications need system access to modify or tweak your phone’s functionality. You would want to tweak the system to achieve various goals i.e. modifying the outlook of your phone’s display, tweaking the performance of the phone or to enhance the battery life. There are applications like Ultimate Backup using which you can backup entire phone including the data of applications and games. Greenify is a root-specific application to fix the battery life of your phone and the list goes on. In order to root Galaxy S7 and S7 Edge on Android Oreo, we will first have to flash TWRP custom recovery on the phone. Now the TWRP recovery comes with its own benefits. It will let you flash custom files on the phone, backup all the partitions, sideload zip files, modify the partitions and whatnot. Let’s start the process to root the Galaxy S7 and S7 Edge running Android 8.0 Oreo firmware. Note: Processes like flashing a custom recovery and rooting the phone void the warranty of your phone. These process will trip the Knox counter on your Galaxy S7 and S7 Edge. If the Knox counter is tripped once, you will not be able to claim the warranty of your phone. We or the smartphone manufacturer do not recommend customizing the phone. Make sure that you understand all the risks involved and you are proceeding at your own risk. A computer running Windows operating system or Mac. Odin installed on your computer. Samsung USB Drivers should be installed on your computer as well. An original data cable to connect your phone to the computer. A Galaxy S7 or the Galaxy S7 Edge running Android Oreo. This guide is only for the Galaxy S7 and Galaxy S7 Edge. Do not try this on any other phone. Your Galaxy S7 or S7 Edge must be running on latest Android Oreo firmware. This guide is for the Exynos variants of the phones only. If you are not sure what variant you are using, have a look at the list of Galaxy S7 and S7 Edge variants. Enable OEM Unlocking and USB Debugging on your phone from developer options. Here’s how to do it on Android Oreo. Your phone’s battery should be charged up to 50% to last throughout the rooting process. Backup everything from your phone since this process will wipe your phone completely. Turn off Antivirus or Windows Firewall if it’s enabled on your computer. Follow the process very carefully. Open Odin 3.13.1 on your computer and click on the AP tab, select the TWRP recovery.img.tar file. Now put your phone in download mode. To do so, turn it off first. Turn on your phone by pressing and holding Volume Down + Home + Power key simultaneously. Your phone will be in Download Mode now. Connect your phone to the computer now. Odin should turn the ID:COM box blue. Click on Options tab in Odin and make sure that the only option ticked is F.Reset Time. All other options should be unticked. Auto Reboot must be unticked as well. Click on the Start button in Odin now and let it flash TWRP recovery now. Once the TWRP has been flashed, reboot your phone into recovery. To do so, press and hold Volume Up + Home + Power button. Do not disconnect your phone. Now in TWRP, you will be asked to swipe the screen to allow modifications. Swipe the screen as you want to root the phone. At this moment, your phone will not show you the internal storage or anything. Tap the Wipe option > Formate data or perform a factory reset. Your phone will show you the internal storage now. Tap the Mount option now to transfer files from your computer to your phone. The phone will appear as USB storage on your computer now. Open it and copy the DM-Verity and SuperSU.zip files to your phone. Now go back to the main menu in TWRP and tap Install > Install Zip > Locate and select SueprSU.zip or Magisk.zip file and flash it. Similarly, flash the DM-Verity.zip file. It will take around 10-15 minutes for your phone to boot up for the first time. Enjoy rooted Galaxy S7 or S7 Edge on Android Oreo now. This was quite a long method. Back in the good old days, it was very easy to root the Samsung devices. With the security getting tight, it’s becoming harder to the Android handsets. There are new security procedures introduced with each new version of Android. The method may be lengthy, but thankfully, it still works. Let’s hope that Samsung doesn’t kill root access. Enjoy it while you can. If you are stuck with something or you have got any other queries, feel absolutely free to reach out to me through the comments section.